Her mom documents her travels on a Facebook page called "She Loves Police"
Girl Wants to Visit Every Police Department in Mass. Eight-year-old Dakota Matthews of Plainville is on a mission to visit every police department in Massachusetts. For most, a trip to the police department means trouble, but for an 8-year-old girl from Plainville, Massachusetts, it is all part of a plan to say "thank you." Dakota Matthews is on a mission to visit every police department in the Bay State. She has 351 on her list, and in a few short months, she has been able to stop by close to three dozen. "I usually tell them, 'Thank you for what you're doing, and keep it up,'" Matthews said. In return, the officers she meets often give her swag. Her room is filled with hats, pins and a growing collection of police patches. The items have become the third grader's most prized possessions. It is no surprise to her family she wants to be a police officer when she grows up. Her mom documents her travels on a Facebook page called "She Loves Police," and she says there is a special reason why her daughter is so determined to thank them. "Four years ago, she fell," her mom, Cherie Boisvert, recalled. "It was an accident, but she fell and she had a seizure and what she remembers is being surrounded by police officers when she woke up. They were the first ones there." Since then, her mom says she has been obsessed with police officers, always stopping to say hello or take a picture. When her daughter came up with the idea to visit every department, she was all in. 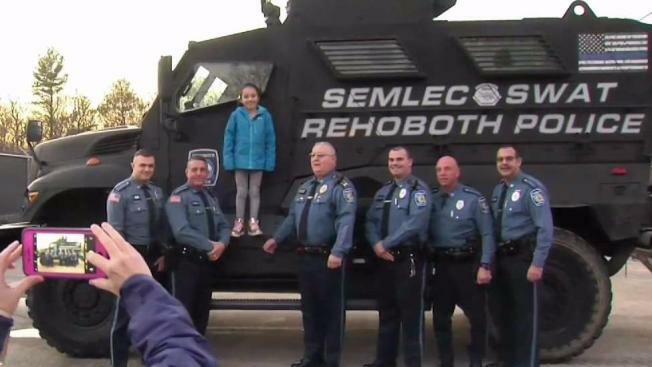 On Tuesday, Matthews visited the Rehoboth Police Department where she was greeted by Lt. James Medeiros and a number of officers who gave her swag and a tour of the department. "Good luck to you," Lt. Medieros told Matthews as he gave her a hug before walking out. "You keep us happy. We're all smiling now." Rehoboth marked number 35 for Matthews. She still has 316 to go and hopes to accomplish her goal by her 13th birthday.